It’s time I outed us: we’re pregnant. Or Sophie’s pregnant. I’m just getting fat. Between us, we’re going to have a baby in September. 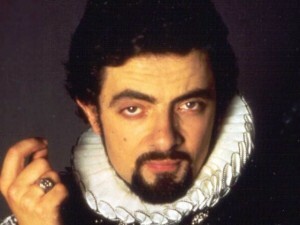 It’s not every woman who would make a Blackadder reference at a time like that. It’s not every woman who could. In a much-much-less-important but still-worth-mentioning development, I won’t be able to make it to WorldCon this year. I wish I could, but the baby is actually due during WorldCon. So I’ll have to deputize someone else to pass on the Campbell tiara. It’s especially awkward because The Magician King is up for a Hu^H^H^H^H^H^H^H^H^H^H^H no wait, scratch that last part. Not a problem. So to recap: after two daughters (currently 7 and 1 respectively) I will soon have a son, and will probably have to rethink everything I thought I knew about parenting. Which wasn’t much, but still. Also, naming rights are still available. I take PayPal. How about Quentin? It’s one of those old school names you just don’t see much any more. I have a friend named Quentin who goes by Q.
J. Huey Grossman. Has a ring. And Baby Huey is all kinds of awesome. Excellent news, Lev. I’m a big fan of William – love Will and Billy – both of which sound AWESOME with Grossman. My son is named Cormac, after both the Irish King and the writer. It’s been a good name thus far. Ender. That’s what we would have named our Third if we hadn’t been too chicken to actually do it. His name is Everett instead. But on to more important things. WTF. Why is your tour going to WINNETKA ILLINOIS but not to Charlotte? Seriously? Somebody in this town needs to start courting authors. In a city that attracts presidents, national democratic conventions, major artists, world-renowned musicians, it’s simply unconscionable that my favorite authors never visit. Except Kathy Reichs and she doesn’t count because she lives here for goodness sake and anyway I like her but she’s not a FAVORITE. I’m offering cookies and milk. Which is a huge thing for me because I don’t bake and my son is lactose intolerant. When are you coming? Oh yay! That is fabulous news. Sigh. Babies. I love babies. And to go to the Worldcon, all you need is a cunning plan. Congratulations! I have the best of both worlds — my nephew was born about three weeks ago, so I get all the cuddles and cute moments without the acute sleep deprivation. They named him Owen and I had to swiftly change the name of the childhood bully in my novel before I published it.